To be entered to win a one year subscription, please leave a comment below by January 15th! Be sure to leave the name of your best crafty friend and we'll send them our current winter issue too! We love to share. Please be sure to visit all the amazing companies and designers in this amazing blog hop by clicking all the links below! Thank you for joining us! Wishing you a Happy New Year filled with peace, health and happiness friends! Thanks so much for the continued inspiration! I’d love to have a subscription and I’m sure my friend Christine Pennington would also love the winter subscription. What an amazing blog hop! I enjoy the wonderful inspiration you provide and I know Addie Albrecht would also enjoy it. So awesome!!! My crafty friend Lori Borntreger would love it!!! Thank you! Love your mag! How fabulous! My craft best friend is Anita Autore. I would love to win a subscription and so would Lindy McCarthy! Love your magazine and reference my copies often. My friend Sonia Smith would love a subscription too! I love SCT; have subscribed for a few years now. I know my friend Deaune Burdette would love a subscription too. What a great prize. My cousin would Janice Barker would also love it. Would love this prize! Happy New Year! Happy New Year! What a wonderful prize! My bestest crafy friend is Gretchen Weller! Oh please let me and my bestie crafty Rhonda Avila win! Love your mag! WOW a great gift. My sister Mona Wright would also love to win this. She reads her craft magazines from cover to cover! Awesome prize and my favorite crafting buddy Patty would love to win also. Thanks for the opportunity! Happy New Year! My sister in law Nancy & I would both love to be able to hold one of your magazines in our hands. Thanks for the chance. Great prize. Theresa is my craftiest friend. I love papercrafting and your magazine has so many great ideas! What a wonderful prize! I’d love to win the subscription & it’d be great for my friend, Rosemary, to get a copy of your winter issue–thanks for the chance! This hop may take awhile… Love it! Who wouldn’t love a subscription to this wonderful magazine? It would also be great to share with my friend Taylor. Happy New Year! I think my crafty friend, Judy Rozema would love to win a subscription, too! What an amazing blog hop! How exciting is this hop! Tank you for the generous giveaway! :))I’d love to send my friend, Joelle this fabulous magazine! Thank you SCM for this generous giveaway! :))I’m sure my crafty friend, Rynne would love to receive this fabulous magazine! Brilliant blog hop, thanks for the chance to win a subscription. I think my crafty friend Ruth would really love to get this as well. What an adorable layout. Thanks for sharing. I would love to focus on spending more quality time with my family. Love your publications. My crafting friend is Amy Whitehead. Happy new year! I would love to share the prize with Dana Joy if I win. Thanks! Best wishes. Happy new year. Jana Mangum is my crafty friend. What a lovely prize. I don’t have any friends that paper craft, but I wish everyone else good luck! It would be a real delight to have a subscription to SCT magazine and I am sure my friend Deanna would love it too. Happy New Year everyone! Would love to win a subscription and the winter issue would be most appreciated by my friend Sandy. Thanks for the chance to win. Happy New Year. My friend is June Hillyard who organises my local crop. Happy new year!!! Thanks for a chance to win a subscription! My friend Surichi Goyal would love the winter issue!! Happy New Year!! Looks like a great prize!!! Nothing replaces holding a magazine in your hands!Great prize. Thanks for this generous hop!! I look forward to getting started. I would love to share a magazine with my sister, Mary Jane Richardson! Would love a copy of this great magazine and sure my friend Rae Valabek would enjoy one also. Wow, I would love to have a years worth of inspiration. I think my friend Karen Letchworth would like it too. I’d love to get my hands on a copy of your magazine! Laura Sabourin deserves a copy of SCT for being the best friend ever! Luv her to the moon! Happy New Year. My crafty friend is Eileen Wiley. Wow what a blog hop! Thanks for the inspiration, I would love to win a subscription and my favorite crafty person would be Tracie Paulsrud, my daughter. I would love to win a subscription to your magazine and I know that my friend Maureen Kugelman would, too! Thank you for having an actual in print, hold in your hand, magazine. I dislike reading magazines on line. How fun is this and it’s so great to know that there is still a crafty magazine in print as that is the best kind there is!! I know my crafty friend, Leanne P., would love this magazine as well! Happy New Year! How fun, I’d love to win a subscription! (One) of my best crafty peeps would be: Katie Brooks! Great way to begoin the year! My special crafty friend is Cindy. I know both of us would love this! Theresa Kane is my crafty sister, thanks for the chance to win! Love your magazine and blog. My friend is Deanna Call and know she would love an issue. Thanks for a chance to win,. Such a fun prize! Great blog hop! My mom and I always go to Crop and Create together!. She also pays for my SCT subscription every year! How nice would it be if we both could get free subscriptions!! Thanks ladies for all the inspiration! I would love a chance at a subscription and I am sure that my friend Sarah Ackerman would love a copy also. Thanks for the chance. My resolution this year is to get rid of things that I haven’t used in years. Happy New Year to the SCT team! Love, love, love all the inspritation in your magazines and it makes keeping up with new tools and techniques easy peasy! My good frlend Tracy and I would thoroughly enjoy the luxury of your new mags. Thank you for the opportunity. Lovely magazine. My friend that would enjoy it is Carolynn Kowalski. What a great prize! I love your magazine and my favorite crafty person is Sarah Elliot. I love all the great ideas I get from your magazine and am so grateful for you to still be publishing and sharing. My best friend and daughter Lisa Articolo would love to win a copy too! Thank you for all the crafty inspiration you share. My crafty friend is Julianne N.
Happy New Year:-) Thank you for the wonderful Inspiration in each issue , I know my Favorite Crafty friend shellye Backeus would love to win a subscription too! How fun … my crafty bestie is Lauren Bergold … we’ve crafted together across the miles for years and only wished we could see each other weekly instead of yearly. Happy New Year! My original stamp partner Pam would love a subscription! Nice magazine, I would love it and so would my friend Jerilyn. Thank you for the opportunity to win this subscription. Favorite crafty person is Judy Cason. and Happy New Year. Thanks so very much for the opportunity to win! I know that my friend Kathie Klenner would also love to win this subscription! Happy New Year! Hurray that you are a scrapbook magazine that is still in print! It’s a wonderful thing. Happy New a Year! My crafty bestie is Anna Z. Always an inspiration! I would love a subscription, of course, and so would my sister Janice Foltz. Great prize! My crafty friend is Shanna Clark. Your magazine keeps all of us in the know for all the latest tools and tricks. My friend Pam and I like to get together and try them all. Happy New Year! what a generous giveaway! my mom Faye Pennekamp would love a crafty hard copy! Happy New Year..My favorite crafty person is Becca. My friend Mary Pieper would also love a copy of your lovely magazine. What FUN!! Happy New Year and thank you for this opportunity! What a great blog hop, I’m loving it! My crafty friend is Linda Christopher. That’s an amazing prize! Thanks for the chance to win. My crafty friend is Sarah Moerman. A subscription to this magazine would be wonderful. My favorite crafy friend is my mom, Mary beth. We get together once a week to make cards and it is my saving grace. Love, love, love your magazine! Would love to share with my sister-in-law, Gail Landsman. Me and my friend, Chris, would love to have a subscription to your fabulous magazine! I was not aware of this FAB magazine! My favorite crafty person is Luz Ireland. I would love to win a free subscription! Samantha Slaughter and I wish to thank you for your leadership within our industry. Appreciated. I would just love to win a subscription to your wonderful magazine and so would my crafting buddy, Diane Rusnack. Would love to win the subscription as I can always use inspiration LOL My wonderful and talented DIL Michele Kovack would also enjoy it. Happy New Year! What a wonderful prize! My crafty friend Peg Mosbo would love to receive this too! Happy New Year! Thank you for a chance to win a subscription to your magazine and here’s hoping my best stamping bud, Teresa Kline, will win it as well! Oooh, a one year subscription….that would be awesome! I’m sure my friend Joanne would love a copy of the latest magazine. Thank-you for offering up a subscription. My friend Jackie would love one too. Happy New Year! This is so great! I love your magazine – very high quality! My friend would have to be Jamie! She loves crafting as much as I do! I so LOVE your magazine! I sit and study each page! It’s such a great gift to hold it in your hands! I would love to win a subscription to your magazine! My favorite crafty person is my dear friend, Mary O’Brien! She just moved recently and I miss her! I would love to share this gift with her. Wishing you a happy and blessed 2016! Oh, I would LOVE to hold the actual mag in my hands for a year and Maryellen would love a copy, too! Happy New Year! My best crafty friend is Jean. Thanks so much for the chance for us to win a subscription. Happy New Year! I would love this subscription to keep me inspired to do more crafting. Happy New Year – looking forward to another year of all your inspiration and great information and tips. My crafty friend would be Heather McNally. Thanks! Great blog hop! I would enjoy a print magazine immensely! My favorite crafty person would be my mom as she gifted me with the love of all things crafty! Her name is Elyn Lyon. Very cool! My favorite crafty friend that I think would love to receive a copy is Linda Robertson! Love your magazine! My best crafty friend is Tamara Waldner. I am sure she would love to win a one year subscription! Thank you for this opportunity! Although we live miles away, the person who got me into papercrafting is my daughter, Debbie Cox. Happy new year! I would like to enter my friend NIna too! Oh, I have soooooo many crafty friends, don’t force me to choose only one …. Okay, did a quick draw between 10 and its going to be Anita in France! I’d love to share your magazine with my friend Kacy Vance. I just love your magazine and am so pleased you are continuing to actually print it. I am sooooo from the “old school” and love having my hands on the actual pages! My favorite crafty friend is my sweet granddaughter, Abigail. We love being creative together when we get the chance. What a great prize. My sister JoAnne Vranic would be so excited to receive a copy too. Oooh, would love to win a subscription to the magazine! I’m sure my friend Rachel would love it too! Awesome prize! My best friend and daughter, Felicity Greiner would love to create with your magazine too! Holy cow, that’s a lot of blogs. Thanks for the opportunity to win, and Frances thanks you also. My scrappy friend is Jacqueline. I love the blog hop idea. I get so inspired. Happy ]New Year! I’m sure my friend Cindy Jouppi would be excited I win a year’s subscription from you too! Happy New Year! My niece and craft conspirator Jenny McCracken would also love a subscription! I love blog hops. Thanks for sharing. My friend and I would love to have a copy of your wonderful magazine. Her name is Lori. Happy New Year, have a blessed 2016! I would love to have my friend Marthanda Beckworth to win with me! I love your magazine! Me and my crafty friend Stacy would love to read it together! Happy New Year to you, your staff, and blog team! I would love to have a print subscription – what a great way to curl up with hot chocolate and spend winter days! I know my friend Elaine would feel the same way. For now, lots of great sites to visit from your list. (Thank goodness for a cold snowy day) I can’t wait to get started browsing and being inspired. Thanks! My friend Kristen DeSimone and I would love to get a subscription! I’m curious to find out what this bloghop will bring us. Sure lots of inspiration. Thanks a lot. And thanks for the chance to win ! My aunt and friend Juf Annie is a crafter too. I craft for my own enjoyment, I am my friend. I give everything away to the wind. Fantastic hop and giveaways. Thank you for the chance to win. My crafty friend is my mom Tisha Saltzman. You have a wonderful magazine. Thank you for all the great ideas. My Mom, Karee Roggentine, would love a subscription to your magazine as would I. Happy New Year. I’d give a gift subscription to my daughter, Kathy Lukie. I will name my friend Trudy Martinez! We’ve been making things together for years! Happy New Year – This would be so wonderful – so much inspiration! Crafty New Year to you. I am sure my friend Val Hall would love to share. Thanks for the chance to win my friend Sharon daniels should like to win. I would love to receive your magazine, and so would Diana Moore! In the upcoming 2016 year I hope to get back to scrapbooking. I’ve gotten behind because of all the fun I’ve been having making cards. I don’t have a crafty friend, wish I did. my crafty friend is Valentina! I think my friend Chris Lawlor would love to wind a subscription too! Barbara Kletzman and I would love to win a subscription! What a gift.I much prefer my magazines in print than digital. I am sure that Kathy Barfield would like one too! Love seeing and holding inspiration in my hands! My friend Misti and I would both love subscriptions! Thanks for a wonderful giveaway! Happy 2016! Happy New Year! What a great way to begin with some crazy fun. I would love to share a subscription with my wonderful and crafty daughter Misty! What a fun giveaway! I love that you are sharing with a friend! I think I would choose Joscie Cutchens! Happy New Year! Happy New Year!!!! Your magazine is beautiful! I love what computers can give us access to but I still prefer a paper magazine and a hardcover book!! Digital is just not the same! Wishing you well in 2016! Love your magazine! Would love to share with Brie Schafer. Thanks for the opportunity to win this wonderful subscription. I would also love to share with my best crafty friend, Suzie. What a neat prize! I’d share with my friend Julie. Happy New Year and thank you for this bloghop. I love print magazines! I hope my dear friend, Sylvia Sanchez, and I win a subscription! Thanks for the chance to win. Unfortunately I don’t have any friends who share my hobby, so I can’t name any one. I hope I still have a chance to win. I’d love to win this & one for my crafty Friend Jenn Shurkus. New year,new ideas.Keep up the inspiration. Awesome prize. Nothing like a bit of inspiration to keep you on track. my fav crafty person and inspiration is our lovely, talented daughter, Amanda DiPaolo. Thanks for the chance to win. My friend Lonnie would love this magazine as well. Happy New Year SCT! Thanks for all the inspiration – looking forward to seeing what you’ve got in store for 2016! My sister Melanie is my best crafty friend, and she loves your mag too! I would love to win a subscription to your magazine, my friend Barb Puddy would love it too!!! What a great giveaway!!! Thanks for sharing:) Hilary is my best crafty buddie! What an amazing blog hop and it represents so many wonderful company’s. I would live to get a subscription because I can’t find any scrapbooking or card magazines in my area and I’m sure my friend Shelley would love the winter issue because she loves the holidays. Happy New Year! I would like to share this with my scrappy friend Sandi Clarson. Looks like a beautiful issue! Happy New Year!!! I would love to share a magazine with Mary Smallidge! What a great way to start the new year!! Roseanna Crawford is my craftiest friend and my sister!! Thank you and Happy new year! My crafty friend is Linda Manning — who got me started on this stamping journey in the first place! I can’t believe there is still a craft magazine in print form. I thought they were all gone. Thanks for staying in there for us. Thanks for sharing in the hop. what a great prize – a wonderful way to start out the new year. I’d love to share with my crafty buddy Laurie. Happy new year! My favorite crafty person would be Linda Brown. Thanks for a chance to win. Now that’s a list of places to get inspiration in the New Year. I’d love to get the magazine, and I’d love for my sis-in-law Trenna to get one too. I have more than one crafty friend, but I know Carol Schmidt would love this magazine. Thanks for the opportunity to win!! I would probably share the subscription with my sister Cindy. Love these magazines! My best friend Sasha would love it to! Happy New Year! I’d love to win a subscription, I need all the inspiration I can get, lol. My fav crafty friend would be the talented Rubeena Naz. Thanks for the chance to win. Would love a subscription to your amazing magazine, and my daughter and crafty BFF Andrea would love a copy of your winter mag!! Nice! Would love to receive the journal in print! My crafty pal would be Karine. I would love to win a one-year subscription! My favorite crafty friend is Vanias R! I would consider a subscription win of your magazine quite a prize. My friend Angela Lewis I am sure would love a magazine as well. Thanks for the consideration. I miss my craft magazines so much. Would be thrilled to win. My crafty friend is Sharon Franklin and Happy New Year to everyone!! My best crafty friend is Heather Pearson. Happy New Year! I would sure love to win and so would Greta H! I would love to have a subscription and I know my friend Dylana Goatee would too. Wow, what an exciting blog hop! I would love to start off the year with a subscription to SCT magazine and I know that my BFF Nicole would enjoy the Winter issue. Thanks for the opportunity to win such a fabulous prize! Happy New Year to the SCT team and all the SCT readers/followers! Awesome giveaway, my best crafty friend is Teri Richardson. My favorite crafty person is Sherry C.
Love this magazine! Starting off with a new year subscription would be great!! My best and favorite crafty friend is Kristin Ensley!! My favorite crafty person in Jennifer Del Muro. a subscription would be wonderful- thank you for the chance to win! my. friend Jenny would love a copy of your fabulous magazine too! Happy New Year! I miss print magazines! I think my BFF Lisa Edwards would love a subscription! I look forward to the day when each new issue is available online. My niece Ashley and I would love to receive the magazine in the mail ? I would love to win a year to this magazine. It is my favourite one and I share it when I can with me friends. If I could win one I would want it to be my friend Stephanie. Thanks for the continued support. Happy New Year! And thank you for the blog hop and the chance to win! Such an amazing line up of companies and blogs. My friend is Valerie Smith. That’s a lot of blog hopping but with great companies. My crafting friend would be Barbi Heathcote. A one year subscription to your magazine is a GREAT prize. I only have one friend who is crafty and is an artist. Unfortunately she doesn’t dedicate enough time to her craft. She is a co-worker friend and her name is Sandi. My crafty friend is Caitie Jolley. Oh how lovely. My favorite scrapbook-crafty friend would be Amanda! I hope that we’ll scrapbook more together in 2016! Happy New Year! Am pretty sure my crafty friend, Veronica Zalis would enjoy a subscription to SCT magazine. May 2016 be a great year for SCT! I would love a subscription for myself. Would love to win a subscription to your magazine and so would Cathy Mlodzik! Your magazine looks interesting. My favorite crafting buddy is Betty S.
Happy New Year!! What a fabulous prize!!! My crafty friend is Desiree’ Perkins! Oh my gosh. Always so generous. One of my creative goals for 2016 is to complete all the one little word prompts in 2016 so I follow through with focusing on my word Magic! I’d love to continue my subscription further but it would be awesome to gift my best crafty friend Barbara Lewis too ? Happy new year, my friend Claudia would love to win this! What an amazing blog hop! I enjoy the wonderful inspiration you provide and I know Kamila Routsis would also enjoy it. My favorite crafty friend would be DeAnn Helms. Amazing! My best crafty friend is also my daughter Rhiannon Joseph. Happy New Year to everyone at SCT! My friend Mary Treacy would love your mag, too! Terrific prize for the new year! I know my friend Danielle Buckley thinks so too :)Happy New Year! Wow. Amazing giveaway. Thank you for the chance to win. my crafty friend is Colleen Benedetto. How wonderful!!! This is an amazing prize! I love your magazine!!!! My friend Jenn Dwyer would love to get a copy!!!! Looks like a fabulous issue! I’d share with my stamping pal Laura! Having a great time on this hop… so many fun stops along the way! looks just amazing, always in search of new ideas! Love your magazine – so full of wonderful inspirations/ideas. I would love a subscription, as would my crafter buddy Yuriko Murakami. I would love to have a subscription and I’m sure my daughter and best crafty friend Karen Roth would love it! I have long been a huge fan of SCT – happy New Year!! Thanks so much for the continued inspiration and crafty love! One of my best crafty friends is Carrie Ogden! Thanks so much for the chance to win a subscription – that would be so much fun for me and also for my friend Jan! Happy New Year!! My crafting buddy is Elena! We take many classes together. If it is not her, it would be De! Awesomeness!! I am not able to afford to renew my subscription so this would ROCK!!! I am sure that my friend Sonya Marsha would love a subscription also to inspire her to create layouts of her soon to arrive baby girl!! Thanks for the chance to bless her! What a blog hop! Thanks for the chance to win this great prize. My favorite crafty friend would be Katey. What a wonderful magazine to get a free subscription to, I love it. Lainey would love to receive the Winter issue. SCT is amazing with all their giveaways! I’m just starting out in the papercrafting world, and this would really inspire me! My crafty friend Joan Tracy and I would be thrilled to have a subscription! Happy New Year. I would love to win this and share with my crafty friend Dianne! Thanks and Happy new Year! I won a copy of your inaugural magazine in the Fall Coffee Lovers Blog Hop. I can’t tell you how wonderful it is to have an actual magazine in my hands to refer to over and over again. I pulled it out just today as a matter of fact! I really do like it, and I think my dear friend Geri Greening of Manitoba Stamper would too. Thanks, and Happy New Year. SCT is a great magazine! Would love to win a subscription & I’m certain my crafty friend, Sarah Clinton, would love her own winter edition! Happy New Year! Awesome blog hop! Great prize, my friend Bożena Adamusińska would sure be thrilled to receive a copy of this awesome magazine filled with inspiration! Great idea and wond Raul blog hop! Thank you. Great idea and wonderful blog hop. Thank you! I would love to win a year subscription! I would love to win this FABULOUS prize and my friend Vilma would be thrilled also! Thanks for the chance. My favorite crafty friend is my daughter. My best crafty friend is Carole Desaulniers! Happy New Year!!!! I didn’t know there were any scrapbook magazines in print anymore. I’ll have to check it out!!! I would love to win a subscription and my friend Ruthann would love to win as well. My best paper-crafty friend is Pat Huggins! It would be fun to win this magazine subscription!! Would love to win a subscription. I’m sure my friend, Renee Cowan, would love a copy as well. May 2016 be my year of crafting! My craft friend Connie Hostak would love ot win a subscription, too! I would love to win and I am sure my niece Krista Ritskes would also like to receive your magazine! Happy New Year! My favorite crafter person is my sister Torri Davis. What an awesome give away. Happy New years!! My crafty BFF is my friend Sabrina from Germany. She is the one who introduced me to the crafting world. Love her so much! What a great blog hop! I think my Mom would love to win a subscription to your magazine! Free subscription. Oh ya! My friend Susan would love one too. What a wonderful prize,it’s so special,sweet and creative to all of us! Happy New Year!!! Oooo . . . fabulous prize! Who doesn’t love to look at gorgeous photos of cards and new products?! My best crafty friend is my mother-in-law, Cindy Mills. My favorite crafty friend is Kayla Polak would love to win a subscription too. Happy New Year! Would love a year of inspiration. I hope to craft more with my friend Anne G.
My favorite Crafty person, well I let you choose another person off the list. Thanks for the chance to win. My sister Mary is my crafty friend. What a wonderful gift and I know my friend, Martha, would love to receive this too!! Happy New Year! Love your magazine and I know Jillian Vance would love a subscription too! What a wonderful offer; my friend, Mary, would love a copy of your fine magazine. My crafty friend, Beth, would love to win a subscription to your magazine. Awesome!! My niece my crafty friend!! Thx u 🙂 Happy New Year 2016! Wow, it’d be awesome to win a full year of your magazine! My crafty friend Denise would love your winter issue! My favorite crafty friend would be my boss, Sharon K.
I’d love to win a subscription to your magazine. I’ve learned a lot from the issues I have. I’m sure my friend Darlene would love the magazine, too. Thanks for the chance to win! Great idea. My favourite crafty friend would be Liane D.
My favorite crafty person is Cindy Kari. She is such a special lady and so talented. Thank you for the chance to win. mary blinn is my craft friend but there are quite a few in our little group that gets together at least monthly. O Woozer winning a year subscription would be awesome. Now onto the hop. Thanks everyone. My favorite crafty friend, Judi Fisher and I would love to have a subscription. Thank you! I absolutely LOVE crafty magazines in print, thanks for the opportunity to win! My best crafty friend would have to be my cousin, Linda Ewer! Great to know about another source of inspiration. Happy New Year! Would love to win a subscription and Catherine Peel would love one too! Thanks for the chance for a subscription. My best crafty friend is Sharon. Amazing opportunity for a subscription and one for my friend Melissa Bedard! Thank you for the chance to win this awesome subscription! My mom (Bunny Vance) would also love the magazine. Happy New Year! I would love to win a subscription and so would my crafty friend, Donna Phillips! Thanks very much. Cheers. Happy New Year!! I think my crafty friend, Kim would love to receive the winter issue. Off I go to check out the blog hop. What a great way to start 2016! My crafty SIL, Paula, is also big fan of SCT. I would love to win a subscription! What a lovely gift! What an awesome giveaway! I would share with my scrappy friend Leanne! Happy New Year! My favorite crafty friend is Stacie Johnson! Wishing you a very blessed new year! Thank you for the opportunity to win a subscription to your magazine! What a lovely prize that keeps going for a year! My sister Kath Manges is the one who got me into papercrafting, and I know she’s love to win a subscription, too! I love your magazine and would be thrilled to have a whole year of eye candy to look at! My friend Sheryl Shilling would love it too! Thanks soo much for the opportunity to win! My crafty BFF is my Mom, Colette. Thanks for the chance! I know my friend Andie Miller would love to win too! New to this site and this hobby, looking forward to seeing what it is all about. My mom Kathryn Heughan would love a subscription as well. Wow! This must be the longest blog hop I have ever come across! And so many of my favorites are participating! My favorite crafty friend would be my daughter Saee. This is an awesome giveaway! Hope to win! My best crafty friend is my mom, Judy. I love being able to share techniques and ideas with her from our different classes we take. I don’t do resolutions! This is an awesome giveaway! Hope to win! My mom is my best friend, always was, always will be. This is an awesome giveaway! Hope to win! my mom is my bestie! always was, always will be! Love this hop!! What a great prize! My buff Jan Thomas would love this too! THANK YOU for being part of this wonderful Blog Hop and giving us the chance to win such and AWESOME prize!!! THANK YOU for all the CREATIVE INSPIRATION you share all year long!!! My craft person is Linda Brillinger who is all kinds of fun to create with. Happy New Year! Love your magazine and love that it is still in print. My friend Carol would love a copy of your fabulous publication! I would be so thrilled to win a subscription. I would like to share with my crafty friend Sandra. What a great way to start the new year!! 🙂 I’m sure my friend Rebecca Wong would love this too. Thanks for being part of this amazing hop! I am sure my friend Amanda Fisher would love to win an issue! Beautiful magazine, would love to win. My friend Denise Graves would love it too! I have been looking for a card making magazines! Awesome giveaway, so generous of you! My besties crafty person is Aurora! Lovely yummy sweet goodies for new year! Thanks for the chance of winning! WOW, i would love win this with my crafty friend, Juliana! I want to share with my best friend Natasha! My far away crafty friend, leesa berry, would love a copy too! My favorite crafty person would be my Mom, Alice Aaron. Happy New Year! I would live to start the new year with a SCT subscription! And, I would love my BFF, Gerrie, to receive a copy of your winter issue! My best crafty-friend is Elena Voronina. She is awesome women and very inspiring crafter! Love her! Wow! I would love to win a subscription and so would Anna Rita Genovesi too!Thank you for this amazing chance and Happy New Year! I would love to win and my scrapping friend Lisa Risser would love your winter issue. How much fun is this blog hop! My fav crafty person is Crystal Bernsdorf and we’d both love to win your magazine. Thank you for the awesome chance! Awesome blog hop! I would love a subscription and I’m sure my friend Jennifer Capasso would too! Thanks for the chance to win. Winning a year’s subscription will be wonderful. I love having inspiration in my hand and in print to look through. Would love to see your magazine and have a subscription. My crafty quilling friend is Rita S.
Great prizes, thanks for the chance to win. Happy New Year! My crafty friend Melinda would love this. Awesome prize! My sister, Wendi would love it too!! I love the inspiration offered in your magazine.i presently read it on line. My friend Karen would certainly appreciate a copy also. Happy New Year! Lovin this hop. ? My bestest crafty friend is Sandy Kortan! I have several crafty friends, but am not sure how many of them do paper-crafting. My daughter-on-love, whom I like to take credit for picking (but my son met her first!) is amazingly artistic and also crafty, so I would share with her first! Amazing inspiration in both the mag and blog hop! My crafty friend is Salma D.
I’m on the lookout for some crafty friends but in the meantime I’d love to gift it to a young crafter starting out new. My resolution is to get my website moving along. Thanks for being a part of the hop. I would love for my friend Sherri Kent to receive a subscription. Happy New Year! What a wonderful cover! I will definitely have to check out this magazine! What a great giveaway – I think Alisha would like it, too! I have several crafty friends! Pretty sure Barbara Kursten would love a copy! Love your magazine! My friend Arleen would love your magazine too! I would love to receive a subscription! My favorite crafty friend is Beverly Perdue! Wishing you the Happiest Year ever. Have a happy and healthy new year! My favorite crafty person is Kathy…we share many ideas with each other! We would both love to win…thanks! What an awesome giveaway- can never have too much inspiration! I’d love to share a subscription with my crafty friend, Ivy Wong! Wow – what a great chance to win! A one year subscription would be a dream! My best crafty friend is Iris Laufer! Think she’d be happy, too! My facebook friend Donna Demko would love this magazine. I would love to share a copy with my daughter Kathy Lukie. I finally reached the end of the hop. It’s been amazing. My favorite crafty person would be A.Vernot. Thanks for the opportunity to win! TFS, I would love to receive your wonderful magazine and Im sure that Judy Studer would too! Love your magazine! Thanks for blessing a lucky winner! Wonderful blog hop, it may take awhile! My favorite crafty person is my daughter, Ashley! My best crafty friend Sherry R would like this prize, I’m sure! My daughter would love a subscription too! I would love to win a subscription! Good luck to everyone! Happy 2016! My fellow Alaskan friend is Lisa Johansen! Awesome giveaway! And Trish Mol is my crafty mom! Looking forward to spending 2016 with you! I would love to share a subscription with Becky Wack. I hope this new year is the best one ever! Happy New Year, I would love to win a subscription, my crafty friend would be Eileen. My craftiest friend is Elly. Happy New Year! and thanks for a chance to win! My best crafty friend is my sister – and she would love this. Happy New Year! My crafting buddy Denise Peterson would love some inspiration too! I’m so excited to follow the hop. I haven’t done a hop in a long time and with my loss of mojo right now I can’t wait to hopefully walk away filled with inspiration! I would also be ecstatic to win a subscription and an issue for my bestest crafty friend that I met through this amazing industry…Holly Waller:). Thank you!! I would love to win a subscription! Sweet! One of my best crafty friends is Alyssa Clawson! Happy New Year! I know my crafty friend Carlye would love a subscription!! This is JUST the blog hop I need to inspire me before the workaday world begins again. I’d share my subscription with my scrapping niece, Dana, in Ontario! She’d be SO surprised!! I would love a subscription to your magazine! Thanks for the chance to win! 2015 was a crazy year for me so I’m ready to get back on track for 2016 and the ideas in your magazine would be a fantastic start. I’d love to give a gift subscription to my sister, Marie Fougere, who lives an hour away. Maybe we could scrap together this year! Love your magazine. Let’s se-as for resolutions, I think I am going to resolve to get organized, finish projects, and get my house finished. I would love to have a subscription to the magazine. I’ve always enjoyed it! Happy New Year! I love your magazine this would be amazing! Thanks for the chance! And I name Julie Tatro! What a great giveaway. I’d love to win a subscription and my crafty friend Gladys Doncaster would love it too. My favorite crafty person would be Sabrina Bowman. Happy new Year! My crafty friend is Darlene . I love to look at this publication! So many good ideas! Fantastic prize my neighbor lori casson would love the prize also! What a fun way to ring in the New Year! My favorite crafty friend is Shirley. For my Third Fridays crafting buddy Erica Toth, we look through your magazine all the time for inspiration. We craft better together because we it ‘s easier to layout each others albums then doing our own! I would love to win a subscription! I think it is a great magazine! I bet my friend Nicole would love it too! My best Crafty friend is Paula Dinh. Wish we didn’t live so far apart – I’m in Wisconsin and she’s in So. California! WooHoo! I think my far away friend Dianna Vale would like a copy too! Thanks for a chance to win! my crafty friend would be Trent Miller! I would love a chance to actually have you magazine in my hands instead of borrowing and for my friend who I have never met except thru social media She has encouraged me to get back to my passion Papercrafting nearly 2 years ago her name is Angeline Choo.. Thankyou and HAPPY 2016. ???? Ooh, thanks! Hmmm…my best crafty friend would be my “adopted mother” Judy…but she’s not into scrapbooking…soooo..maybe I can give you the name of somebody IF I win? I’ll find somebody else who’d love this! Happy New Year! My favorite crafty friend would be my friend Kathy! Great cover on the winter issue!! I’d love to win, so would my friend Dee. What a great blog, my most crafty friend would have to be Teresa Doyle! Very inspiring and always has great ideas!! Happy new year! Happy New Year. Thanks for a chance to win a subscription to your awesome magazine. My favorite crafty friend is Bev McClendon. My favorite paper crafty person is my sister Stacy Stuart. Thanks for the chance to win. I am new at blog hops but this is more of a sprint than a hop. My friend Amanda would like your magazine too. I am new and I have never seen your publication, I probably would love it! Your front page is truly adorable. Would love to see the inside. Thank for the opportunity to win. Thanks for the chance to win a subscription. 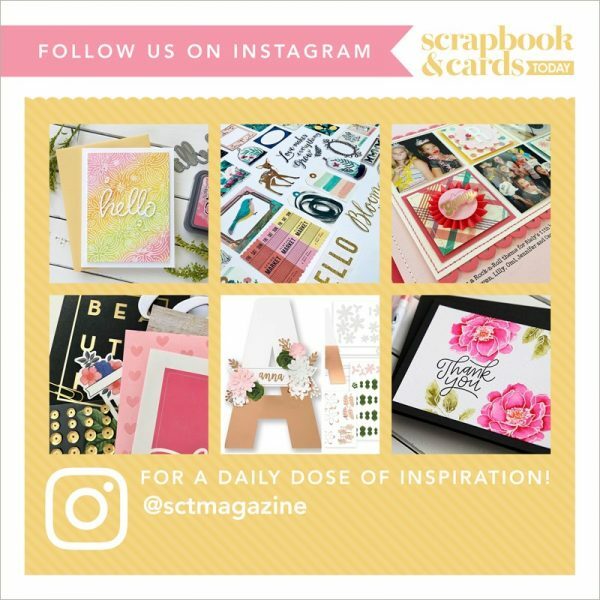 . .
Scrapbook & Cards Today is my go to magazine for ideas and inspiration. I know I would enjoy a year long subscription and one for my daughter, too! Happy New Year! My friend Michele L would love this as well. I would love a subscription! My favorite crafty person is my daughter, Celeste. Love your cover page! I want to see whats inside! I would love a subscription to your magazine!! My best crafty friend is Gina! I love getting ideas and new inspiration from you guys, y’all rock!! Thank you for doing this great blog hop, and I think my friend Laura Sivert totally needs your wonderful inspiration and would love to get her hands on your Winter issue!! Great chance to have a full year of creation. I know my friend Sharon DeBrocco would love to get this! Woo Hoo! I miss magazines. My friend Veda Taylor would love it too. Happy 2016! Crafty friend: Patricia Roebuck! Would love a subscription! My favorite crafty person is Adriana who got me started in papercrafting. I would love a subscription and I know my sister Gayle Etter would too! What a wonderful prize! My favourite crafty friend is Stampingdani: she will love your magazine! Happy New Year. I’m afraid I don’t have any crafty friend yet. Happy New Year! My crafty friend is my daughter Lisa. Great card. My friend Mary Tafelsky needs a copy of the magazine too! I would love to receive your magazine and would also love for my friend Colleen Foelker to be included. Thanks for the chance to win! I love your magazine and my friend Carisa Phillips would too!!! So glad I found this hop I have been looking for a magazine to get now I found one. Thanks!!! Thanks so much for the fabulous inspiration S&CT always provides. I would love to win a subscription … my Favourite Crafty Person is my sister, Kim Ebert. 🙂 Thanks! I’d love to have a subscription and so would my daughter, Emily Daigle. Thanks for the oppertunity to win! Happy New Year! Thanks for the chance to win a subscription, I think my friend Diana L. Would love to receive one too! What a great giveaway – thanks for the opportunity to win! I think my friend Amy Crockett would love it, too! Thanks for the inspiration! I would love a subscription to your magazine…also please include my buddy Diane Giarrusso too! Fabulous Hop! My favorite crafty bff – Michele Ferguson! Many thanks! Thank you for the chance to win this wonderful magazine. My best crafty friend would be my sister Colleen Hagerman! Thanks for being a part of this truly amazing hop. My crafty friend is Melody Winston. I think my crafty friend, Beth Williams would enjoy a subscription. I know I would. Oh My God a free subscription of a Magazine when most of the magazines have dissappeared. Would love that for me and my dear Friend Barbara Parker. She is my scrapbbooking buddy and also loves to make cards. Thanks for the great gift. Would love to win a subscription! Whew … just got through everyone’s post. What a fabulous blog hop. Thank you to everyone for being so generous. Hope 2016 is filled with PEACE, love, hope & much crafting. I would love to receive and to share your magazine. My crafty friend is my girlfriend’s mom, Viv. I really don’t have any crafty friends, but my best friend has to be my husband, Brandon. He is my biggest supporter and even shares my card making obsession with me. He buys me anything that I say that I need/want and never complains when I spend too much. You couldn’t ask for better!! My best female friend is Jenny Barham, although she’s into cardmaking, she’s into other crafty things like sewing and jewelry making. Thanks for the chance to win! I am sure my friend Stephanie Wright would love a copy too! This is an amazing way to start the year. Thanks so much for the wonderful inspiration from you and my favorite crafty friend Amelia Helm. My favorite crafty person is Barbara Dalessio. We’ve been making cards together for about 6 years now. Thanks for the chance to win. Thanks for the chance to win the subscription and to offer an issue to my sister, Kathy Gettys, who would love this as well. Awesome! My best crafty friend is Kris Van Allen! I have always enjoyed your magazine! Thanks for all the inspiration through the years! Thanks so much for the opportunity to win! I’d love to include my friend who is the reason I started making cards, Beth! Happy New Year! Thank you for a chance to win! I think my mom, Dana, would love to win one too! Love your magazine! Thanks for this opportunity. My favorite crafty person would be Julie! It’s so nice to have a print scrapbook/card magazine to gain inspiration from! I would share with my sister in law, Aileen. Would love to win a subscription to your magazine. My favorite crafty friend is Mary Fekany. Would love to find this in my mailbox!!! I’m sure since today is my Pal Melissa Oeter’s birthday she’d love an issue too!!! My favority crafty person is my niece Jordan Asselin. I love card making and your magazine has so many great ideas! I have not seen your magazine on sale yet. My best crafty friend would have to be Scholly Ketcher in Arizona. Happy New Year!! Looking forward to 2016 and all it’s beautiful surprises. I have two amazing crafty friends…So if I get chosen I would will have to figure out how to bless them both: Amanda and Eileen! Thank you for the amazing opportunity. My subscription is coming to an end and I always share it with my mother, Alma Easterwood. We would both love to win. My friend Rhonda and I would be ever so happy to win a year’s subscription to your wonderful magazine – thanks for the chance! Happy New Year! I would choose my crafty friend, Julie Flack. I really appreciate your blog. So easy to get lost for hours. It’s a Beautiful magazine! Happy New Year! I hope for more crafty time this year. Thank you for keeping the contest open for a nice length of time, it’s a long one and I truely appreciate it, since I sub’ to so many blogs. ;). My best crafty friend is my daughter, Katie! We have so much fun crafting together. If I win, I will share her email address, she does not blog at this time. Thanks! Have a Great year. I love your magazine and would be so thrilled to have a hard copy in hand to drool over! I know Cassie Wiscarson would love it too! My crafty friend is Janette Dewar who also loves your magazine! I love your magazine!!! So many great ideas!!!! Thanks for the chance to win a subscription!!! I think my friend Jane Menear should get one with me!!! What an amazing list that is part of the blog hop. Lots of ideas and products. Thank you SCT. My crafty friend is Joanne Perry. Thank you for the continued inspiration! My crafty friend Linda Velarde would love it too. I would LOVE to receive another year’s subscription to your great magazine. And my friend Deb Ingwersen would love it too! Kimberly Tallman would love to win with me. She does the most amazing Mixed Media Canvas art!